Career and Professional Development - Topic of the Month - The New York State Society of Anesthesiologists, Inc.The New York State Society of Anesthesiologists, Inc. Career and Professional Development - Topic of the Month - The New York State Society of Anesthesiologists, Inc.
Over 50% of physicians exhibit at least one symptom of burnout, which is characterized by feelings of “exhaustion, cynicism, and lack of effectiveness” in the workplace.1 Several factors contribute to burnout, among which an increased workload and a challenging work-life balance. Over 44% of physicians work more than 60 hours per week, compared to less than 10% of the US population 1. In medicine as in other specialties, we view work demands as “dominant”, “inflexible” and “normative”.2 In other words, work frequently dominates other aspects of our lives, it is bound by inflexible hours and tasks, and we accept these attributes as normal. To achieve a work-life balance, we should aim for deliberate allocation of our cognitive and emotional resources to each area. This post explores strategies to shield the life zone from “work spillage”, to allow the work zone to safely expand when needed,2 and to maximize time management and work productivity. At some point we’ve all experienced restless sleep, disrupted by racing thoughts about work demands, specific deadlines and overdue tasks. To avoid the associated stress and guilt and to rein in the work demands, we can expand our work zone, in a deliberate and focused manner. A helpful strategy is to schedule the work time as meeting time, similar to other work appointments, after consultation with the shared family calendar. This gives the appointment both the legitimacy of a work function and the flexibility of convenient timing. In addition, scheduling a bounded period of time for work provides motivation to maximize productivity. In order to optimize flexibility and productivity within our work sphere, it is helpful to prioritize our tasks, manage the time efficiently and work with our own strengths and weaknesses. Our lists of tasks can be discouraging to handle because of a perception of our inability to get everything done. A first step in managing our tasks is to accept that there will always be tasks waiting to be done. However, tackling tasks efficiently and in an organized manner helps to decrease our stress and to increase our productivity. “To do lists” can be helpful both to identify projects and to remind us what remains to be done. Ticking a box or crossing an item off the list can also provide a powerful and potentially empowering depiction of our progress. However, such lists don’t take into account the importance and the urgency of the different listed items. 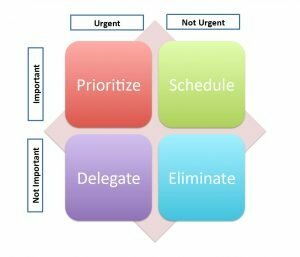 The Eisenhower Matrix assists with task prioritization. This matrix is a 2×2 table (with four resulting quadrants) in which tasks are placed according to their importance and their urgency (fig.1). It is recognized that few tasks will be both urgent and important. The challenge is therefore in identifying the tasks that are truly important, those that are truly urgent, and those that are neither. Once the tasks are classified, we prioritize urgent/important tasks, we schedule non- urgent/important tasks, we delegate urgent/unimportant tasks, and we eliminate non-urgent/non-important tasks. Those who excel at time management complete important tasks before they become urgent; they are therefore free to spend their time doing non-urgent/important tasks. Every block of 5 minutes count. We often avoid tackling a task because we inaccurately estimate the amount of time needed to complete it. However, many tasks can be dealt with in less than 5 min, such as replying to emails, scheduling appointments, and following-up communications. Also, not every task has to be completed in one sitting. Rotate assignments. For larger tasks, assign a predefined and manageable amount of time to spend in one sitting. Set a timer, and then rotate tasks frequently. The Pomodoro technique is an example. Make your work accessible. Productivity requires planning and “personal infrastructure”. Configuring the work and documents to be accessible across devices and locations will give us the freedom and flexibility to work remotely. Our productivity and our ability to concentrate on tasks can vary during the day and during the week. Identifying our time of peak productivity allows us to schedule our tasks accordingly. Procrastination can manifest as a lack of initiative in starting a project, as lack of focus in completing the task, or as frequent revisiting of the process. We can curb our tendency to procrastinate by working in small manageable chunks, by allowing for rewards at each accomplished step, and by using a detailed schedule. Achieving a work-life balance often requires deliberate management of work requirements; setting and respecting the boundaries of our personal life; and keeping a flexible framework to occasionally expand (or collapse) the work sphere as needed. 1. Shanafelt TD, Dyrbye LN, West CP. Addressing Physician Burnout: The Way Forward. Jama. Mar 07 2017;317(9):901-902. 2. Anleu SR, Mack K. Managing Work and Family in the Judiciary: Metaphors and Strategies. Flinders LJ. 2016;18:213. 3. Drummond D. Four Tools for Reducing Burnout by Finding Work-Life Balance. Fam Pract Manag. Jan-Feb 2016;23(1):28-33.